Advanced Tactics Unveils the AT Transformer: The Future of Roadable VTOL Aircraft and Modular Cargo Systems | Advanced Tactics, Inc.
EL SEGUNDO, California, 8 January 2014 – Advanced Tactics Inc., a small aerospace company, released details about its AT Transformer vehicle technology and announced that a full-scale technology demonstrator has completed its first driving tests. 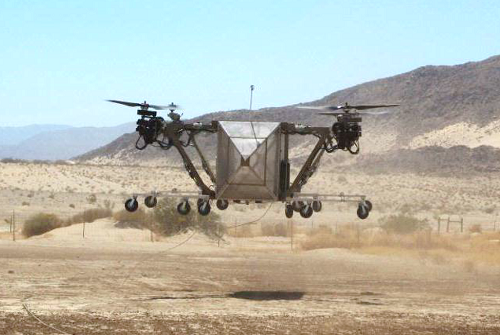 The AT Transformer technology makes possible the world’s first roadable, vertical takeoff and landing (VTOL) aircraft. 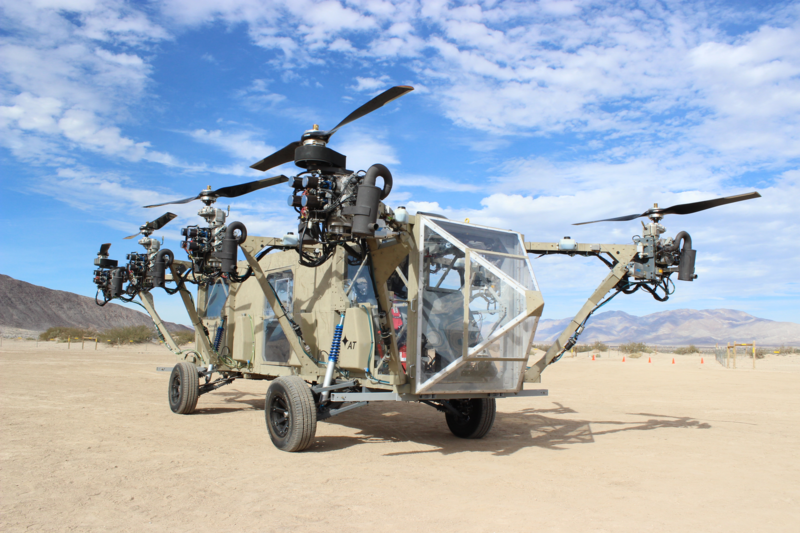 The patented AT Transformer technology combines the capabilities of a helicopter, such as the ability to take off and land anywhere, with the capabilities of an off-road automobile. 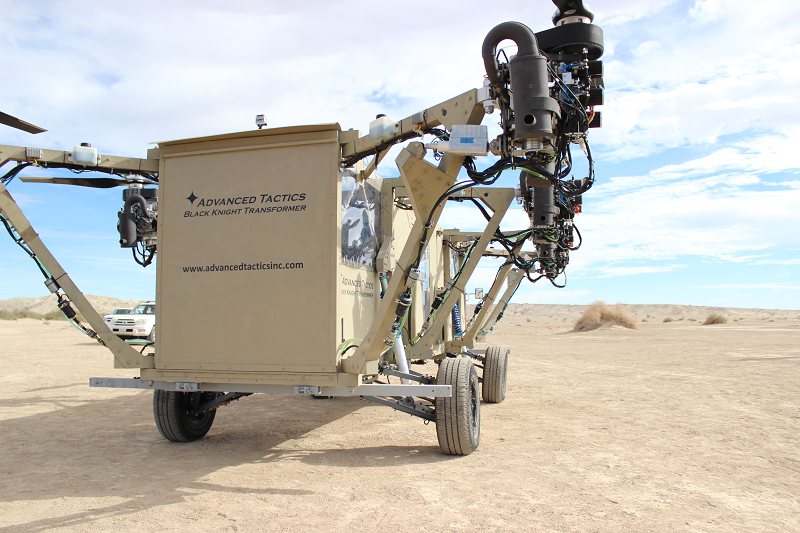 The first technology demonstrator, the AT Black Knight Transformer, completed driving tests in December 2013 in Southern California and is scheduled to fly in early 2014. The AT Black Knight Transformer technology demonstrator (top) and the AT Black Knight Transformer operational concept vehicle (bottom) with turbo diesel engines. Advanced Tactics began work on the AT Black Knight Transformer in 2010. 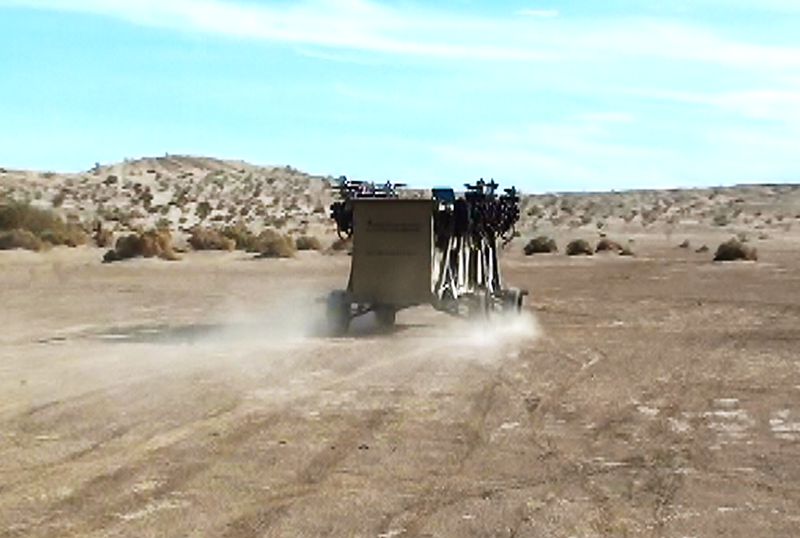 The Black Knight Transformer is designed for autonomous casualty evacuation and manned or unmanned cargo resupply missions. Its unmanned capabilities keep pilots out of harm’s way, making it the safest casualty evacuation option. The interior volume is comparable to a Blackhawk helicopter, making it well-suited for cargo missions as well. In 2012, Advanced Tactics began work on the AT Panther Transformer, a similar vehicle designed specifically for Special Operations missions. It is a low-cost vehicle that carries two passengers and their gear, is transportable in a CV-22 Osprey cargo hold, and is operable with minimal training. This vehicle is shown below and will be used to transport passengers to a remote location that is inaccessible by traditional air or ground based means. The Panther concept vehicle (left) and scaled technology demonstrator (right). Imagine a situation where a soldier has been wounded on the front lines in an urban firefight – he’s being protected by the rest of his squad but he needs to be evacuated immediately or he will die. A nearby base is notified of the casualty and dispatches an AT Black Knight Transformer vehicle to evacuate him. The vehicle autonomously takes off and heads toward the front lines, 20 miles away. The squad is deep in the city and there are no safe landing zones within a half mile radius. Two members of the squad designate a safe landing zone in an open courtyard and wait for the vehicle there. Once it arrives, it lands and the two soldiers climb inside. The flight engines are stowed and the vehicle enters driving mode. It is manually driven through the narrow streets to the casualty, who is quickly loaded onboard and connected to life support equipment. The vehicle is driven back to the courtyard where it takes off. Several minutes later the wounded soldier arrives at the base where he can be given full medical treatment within the “Golden Hour” after injury. The Black Knight Transformer’s unique air and ground ingress and egress options dramatically reduced the time needed to evacuate the casualty and his life was saved without risking a flight crew or the need for a ground transport. The Black Knight Transformer technology demonstrator in flight configuration. The Black Knight and Panther Transformers both utilize the AT Transformer technology, which leverages the simplicity and robustness of a “multicopter” helicopter at a full-scale size. Like the small electric multicopters that are prevalent today, the AT Transformer uses engines with a direct drive connection to prop-rotors. The components of the propulsion system, including the engines and prop-rotors, are low-cost commercially available parts and the aircraft’s structure is made of modular field-replaceable components. Like an electric multicopter, the vehicle is stabilized and controlled by differential thrust between opposing sets of prop-rotors. 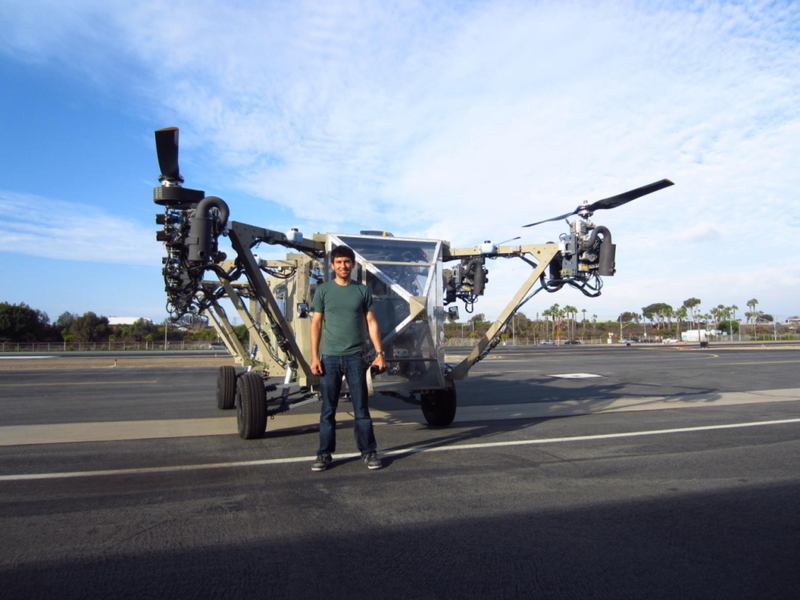 This design is simple and robust, eliminating the mechanical complexity and cost of the articulated rotor system that stabilizes and controls a conventional helicopter and replacing it with a high-speed computerized feedback control system. Additionally, the configuration negates the need for a tail-rotor or engine transmission. The AT Transformer has the ability to perform controlled engine-out flight in case of a critical component failure. AT Black Knight Transformer technology demonstrator during driving tests. The engines are stowed along the side of the vehicle to reach a street-legal width. 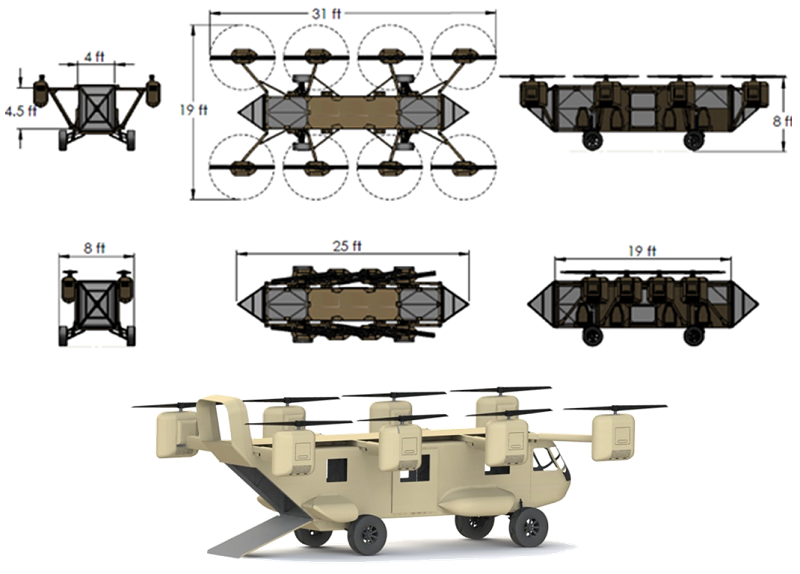 The design benefits from a large interior volume compared to the overall footprint of the vehicle, which makes it an ideal candidate for unmanned cargo resupply missions as well as civil missions such as package delivery and fire-fighting. Both the Black Knight and the Panther Transformers have automotive suspensions and drive-trains similar to those used in off-road trucks. Large truck tires and shocks provide excellent terrain handling and soften the vehicles’ landings. The wheels are driven by an independent engine and transaxle for speeds up to 70 mph. The AT Transformer design is highly modular for rapid repair and reconfiguration. For instance, each of the eight propulsion subsystems can be replaced in the field by two people and the payload bay can be changed from casualty evacuation life support equipment to cargo for multi-mission capabilities. Additionally, the modular automobile portion of the vehicle can be replaced with a boat hull or an amphibious hull for water operations. Four-engine technology evaluation aircraft flown in 2012. It is gas powered and weighs over 2,000 lbs. The Black Knight and Panther Transformer vehicles have been developed through an iterative prototyping process starting with small scale electric prototypes and moving to the larger internal combustion powered technology demonstration vehicles. The first electric prototypes were flown in 2010 followed by a 2,000 lbs gas-powered vehicle in 2012, shown in Figure 6. A scaled prototype of the Panther vehicle has been tested and the full-scale version is in the early design phase. AT engineer, Rustom Jehangir, is standing next to the vehicle for scale. He is six feet tall. 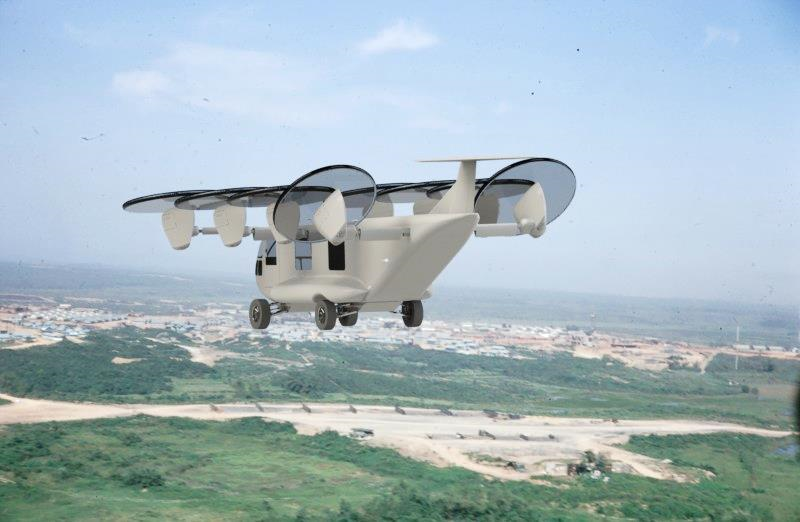 The operational concept design of the Black Knight Transformer is a streamlined aircraft that has been optimized for payload carrying and multi-mission capabilities. That vehicle will use turbo diesel engines and aerodynamic enhancements to provide a payload capacity of over 1,000 lbs or five passengers with a 250 nm range. Configured without the ground drivetrain, the aircraft can carry up to 1600 lbs of payload or eight passengers. The aircraft will cruise at a speed of 130 kts and drive at up to 70 mph. This highly capable vehicle will provide a safe, low-cost option for casualty evacuation, medical and cargo resupply, and other military or civil missions. Black Knight Transformer operational concept design with streamlined aerodynamics and more powerful and efficient turbo diesel engines. After its first flight, the AT Black Knight Transformer technology demonstrator will enter an iterative testing program leading to a full-capability demonstration in late 2014. Advanced Tactics is interested in collaboration and joint development opportunities for taking this, and other patented AT technologies, into full production. Copyright © 2007-2019 Advanced Tactics, Inc.